A new video from a NASA spacecraft takes viewers on a flyover journey of Vesta, the second-largest object in the main asteroid belt between Mars and Jupiter. Scientists constructed the two-minute video from images taken by NASA's Dawn probe, which has been orbiting Vesta since July. In the video, the 330-mile (530-kilometer) Vesta is not entirely lit up; its northern latitudes are shrouded in darkness. That's because the giant asteroid Vesta has seasons just like Earth, researchers said. It is currently winter in the Vestan north, and the north pole is in perpetual darkness. The video highlights a huge circular depression several hundred miles wide near Vesta's south pole. NASA's Hubble Space Telescope first spotted this feature years ago, and scientists have been eager to get a better look at it ever since. The cliffs of this massive depression rise several miles up from its floor, and a 9-mile (15-km) high mountain rises from the structure's base, researchers said. Researchers have used Dawn's images to determine Vesta's rotational axis and to map out a system of latitude and longitude. The team defined the asteroid's zero-longitude line, or prime meridian, using a small crater they named "Claudia," after a Roman woman who lived in the second century B.C. 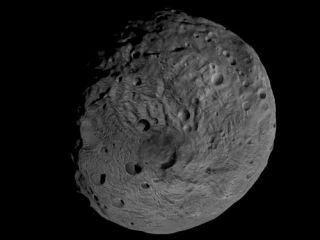 Vesta took its name from the Roman goddess of the hearth, home and family. Craters on the space rock will be named after the vestal virgins — priestesses of the goddess — and famous Roman women, researchers said. Other features will take the names of towns and festivals of ancient Rome. In this image of the south pole region of the asteroid Vesta, a mountain is rising approximately 9 miles (15 kilometers) above the floor of a crater. Dawn captured the new images used in the video while it was still about 1,700 miles (2,700 km) above Vesta's surface. The spacecraft is slated to move down to a lower orbit in October, from which it should be able to snap even closer photos, with a resolution about eight times higher, researchers said. Dawn is expected to reach Ceres in February 2015. The probe's observations should allow scientists to compare the dwarf planet to Vesta. Unlike the drier and more evolved Vesta, Ceres is considered to be more primitive and wet, possibly harboring water ice, researchers have said.